High school bands from Louisiana and Texas will travel to Loyola University New Orleans Saturday, March 23 to participate in ensemble performances and workshops as part of the Loyola Invitational Bands Festival featuring guest contemporary composer David Gillingham, Ph.D. 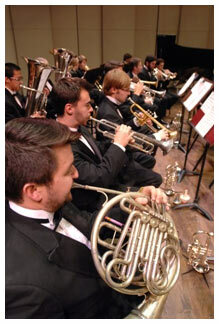 The all-day festival culminates with a free concert directed by Gillingham with Loyola’s Wind Ensemble at 3 p.m. in Louis J. Roussel Performance Hall, located in the Communications/Music Complex. The festival runs from 8:30 a.m. to 2:30 p.m. in Roussel Hall, and each of the high school bands will perform for 30 minutes. Gillingham will host a 25-minute clinic after each performance. A two-hour lunch break will begin at 10:30 a.m.
Held annually, Loyola’s Invitational Bands Festival invites select bands to New Orleans to work with guest artists in an effort to develop better techniques as an ensemble. This year’s ensembles—selected from a pre-recorded audition process—are Berwick High School in Berwick, La., South Terrebonne High School in Bourg, La., Strake Jesuit College Preparatory in Houston, Texas, and Lafayette High School in Lafayette, La. Gillingham has garnered an international reputation by writing works for band and percussion, many of which are now considered standards in the repertoire. Nationally recognized ensembles, including the Prague Radio Orchestra, Cincinnati Conservatory of Music Wind Ensemble, Michigan State University Wind Ensemble and Florida State Wind Ensemble, among many others, regularly perform his works. Gillingham is a music professor at Central Michigan University and is a member of American Society of Composers, Authors and Publishers. He has received the society’s Standard Award for Composers of Concert Music since 1996.